SPEED Nationwide coverage at 4G LTE** speeds when using a 4G compatible device. 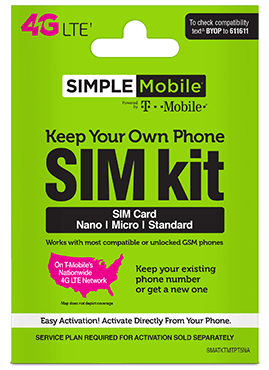 Get a SIMPLE Mobile SIM! KEEP YOUR PHONE, KEEP YOUR NUMBER AND NO MYSTERY FEES! Use your unlocked GSM OR T-Mobile-compatible phone with SIMPLE MOBILE and get nationwide coverage on a lightning-fast network. No matter you phone's SIM card size - nano, micro or standard - we got you! Our SIM kit has 3 pre-cut sizes in one. All you need to do is detach the right size for your phone and activate your service.